My sprouts are up inside and it reminds me that soon we will be heading outside! Early spring is a time of awakening out of doors. For many of us it also a beginning of our own outdoor activity. Warming temperatures and moist conditions also awaken many trouble causing diseases and conditions that quickly demand our attention. · Turn gardens and work extra amounts of organic matter into garden soils if water has been slow to drain following rain showers. Poor drainage often leads to root diseases and poor plant growth. · Plant peas when soil is workable. For a prolonged harvest, plant several varieties, each with a different maturation date. · Examine mugo pines for signs of tiny white flecks on the needles. Also, look at the stems and leaves of euonymus for similar signs. These flecks are the shells of scale insects. Apply dormant oil spray to plants infested with scale. · The work that you do on your lawn will pay off this summer. Make sure that you rake and remove dead leaves and grass as well as other debris. Mowing should begin as soon as grass reaches a height of 3 inches. Then it should be mowed back to about 2 inches. As a rule of thumb, never mow off more than 1/3 of the top growth of grass plants. And leave the clippings on the lawn; grass clippings break down quickly and return nutrients to the soil. · Remove stakes and guy wires installed on trees planted last fall. Allowing a little swaying of tree stems results in sturdy yet resilient plants. Thin out some branches of trees, which have a history of leaf spot diseases. Pruning will improve air circulation and penetration of sunlight, which in turn can reduce the incidence of disease. Also remove tree wraps from the trunks of trees. Leaving the wraps in place results in a build up of moisture beneath the wrap, which could lead to bark injury and promote entry of diseases. · Plant out daffodils, crocus, hyacinth and any other bulbs, which were forced in pots or bowls in the house. Some may bloom next spring, others may take two or three years to rebuild enough food reserve to support flowering. 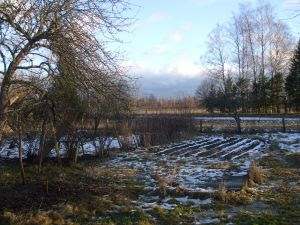 · Prepare new beds for perennial flowers by spreading a 6-inch deep layer of organic matter (i.e. peat moss, compost, rotted manure) and work it in deeply. Plants growing in deep, rich soil are less likely to suffer from summer drought. · Plant climbing hydrangea or Boston ivy if you are looking for a vine to cover a masonry wall or stonewall. Climbing hydrangeas are slow to get started but once they take hold they are magnificent, particularly when in bloom. · Handle seedlings by their leaves when transplanting. Breaking a leaf is not fatal but breaking the stem is. This manner of handling seedlings will also help prevent damping-off disease, a fungus disease that attacks seedlings at the base of the stem. · Prune out dead or damaged branches and twigs of trees and shrubs after new growth has begun. Woody plants, which took a beating this past winter, will appreciate an application of fertilizer, particularly a high nitrogen fertilizer. · Now is the time to begin applications of horticultural oil sprays to pear and apple trees. Apply oil spray to pears just as the buds begin to swell and then again 10 days later to control pear psylla and pear leaf blister mite. Apple tree pests controlled with oil spray include European red mite, aphids and San Jose scale. Make a single application of oil on apple trees when a half-inch of green tissue is visible in developing buds. · Also apply oil to ornamental trees and shrubs with a history of aphid, scale or spider mite infestations. Destroying these pests safely with spring applications of horticultural oil will reduce your use of pesticides later in the growing season. · Pay attention to when forsythia come into bloom. Flowering of forsythia is a good indicator of cabbage root maggot fly activity. Be prepared to protect cabbage and related crops from maggots by covering plantings with row covers. Maggots are more of a problem in cool, wet soils. Be sure not to plant any of these crops where they grew last season. Great tips here. This year I'm planting a new variety of corn, so it will be interesting to see how it turns out. Thank you for the tips! I am ready! Trimming down old shrubs/flowering plants and grasses this weekend! Will be ready for April growth... cannot wait.